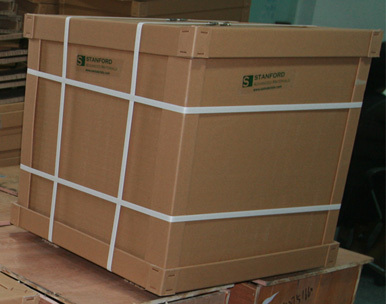 Stanford Advanced Materials (SAM) is an ideal platform for manufacturing high purity Europium metal (Eu metal). Our europium metal is available in forms of disc, plate, etc. We also offer tailor-made solutions. Europium is the most reactive element of all rare earths. It oxidizes quickly when exposed to air. Thus it is usually sealed in oil or processed into granules right after the purification process. Europium Metal, is very valuable material in control rods for nuclear reactors due to that it can absorb more neutrons than any other elements. It is a dopant in some types of glass in lasers and other optoelectronic devices. Europium is also used in the manufacture of fluorescent glass. A recent (2015) application of Europium is in quantum memory chips which can reliably store information for days at a time; these could allow sensitive quantum data to be stored to a hard disk-like device and shipped around the country. Europium is mainly used as a dopant in some types of glass in lasers and other optoelectronic devices. Europium oxide (Eu2O3), an important compound of Europium, is widely used as a red phosphor in television sets and fluorescent lamps, and as an activator for yttrium-based phosphors. Our europium metals are clearly tagged and labeled externally to ensure efficient identification and quality control. Great care is taken to avoid any damage which might be caused during storage or transportation.